Adobe has announced the Edge suite of tools and released the first few pieces; other tools are in beta and still others under development. The company has been developing the Edge tools in what has been (for Adobe) a remarkably public process, with open betas, frequent feature releases, and paying a lot of attention to community feedback. Some of the tools are in forkable GitHub repositories. Here is a listing of the Edge tools and their current status. Edge Animate is a desktop tool that provides a Flash-like development experience and outputs HTML5 animations, implemented in jQuery and JSON. Animate is at release 1.0 now, having been in beta for over a year. Edge Inspect is a cross-mobile-device previewer and debugger. Inspect is at release 1.0; it runs on the desktop, with cooperating pieces installed on mobile devices and as a Google Chrome extension. Edge Web Fonts is a new Web service that offers over 500 free fonts (via Adobe's acquisition, TypeKit), rather like Google Fonts. Web Fonts will be integrated with other Edge components such as Code and Reflow. It is available now in the standard (manual) fashion in which one uses TypeKit fonts. Edge Reflow builds "responsive" Web designs with pages that re-lay-out to accommodate different screen sizes from desktop to tablet to mobile. This tool is under development and is not available even for preview yet; Adobe doesn't give a release date. PhoneGap Build is a cloud-based Web service that packages up, or "compiles," HTML/CSS/JS programs and outputs native mobile apps for iOS, Android, Windows Phone, BlackBerry OS, webOS, Symbian, and Bada. It is available now to Creative Cloud subscribers and has a free tier. Adobe's Creative Cloud subscription is at this point an amalgam of cloud services, software that downloads and installs on a desktop or laptop, and a licensing / validation system that permits the local software to run only as long as a valid subscription is in place. Creative Cloud encompasses a great many of Adobe's products, not just the Web-and-mobile-oriented Edge suite, including Photoshop CS6 and Illustrator CS6. Subscriptions cost $600 per year -- Adobe prefers to quote this as $50 per month. Users with valid licenses to earlier Adobe packaged products qualify for a tier at $30 per month -- seems to me Adobe is being rather generous here, including software all the way back to CS3, released in 2007. How attractive will the Edge tools be to Web developers? It depends on whom you ask. Adobe is catering to the new trend of designers and coders exhibiting some fluidity in their roles. Edge Animate is designed to appeal to creatives who have developed in Flash for years. As to hard-core Web developers -- the commentary on the Ars Technica coverage is revealing. One developer claims, "Most of the Internet is created in plain text editors [i.e. not in WYSIWYG tools such as Edge Animate], and if anything the industry is moving away from packaged development. Plain text editors are getting more common." 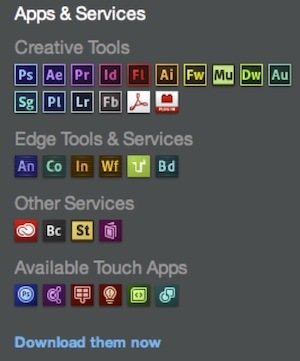 What do you think, do the Adobe Edge tools appeal to the Web developer in you? What about the pricing for Creative Cloud? Let us know in the comments.